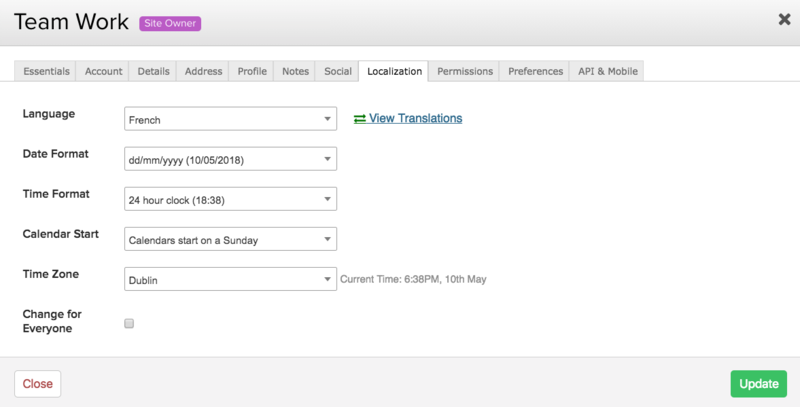 Within Teamwork Projects, you can use the inbuilt translations tool to submit updates to existing translation information for whichever language you have selected in your localization settings. To access the Translations interface, click your profile icon in the top right corner of your site and select Edit My Details from the dropdown menu. From the Edit My Details modal, select the Localization tab. Once you have a language chosen from the dropdown, other than English, you will see an option to View Translations. Clicking the View Translations option will bring you to the Translations area, where you can view and search through existing translations, as well as as-yet untranslated items. You can also access this area by adding /translations to your Teamwork Projects site URL. Note: Only site administrators in the owner company have the option to 'Change for Everyone' which allows you to automatically apply the selected localization settings for everyone on the site.